Cher is a long time famous recording artist and actress. She has done it all, from being part of Sonny & Cher, to being a Grammy award winning recording artist, to winning an Academy award for best actress. Her looks have changed just as much as her career has. It’s not so much that she altered her original appearance, it is that at her later age in life she is alarmingly wrinkle free and skin tight. She admits to having at least some had plastic surgery to maintain her looks over the years, but doesn’t disclose it all. Her efforts to remain an icon of youth have turned her into a plastic surgery poster girl. So much so, that she now tries to dodge plastic surgery questions. When accused of having cheek implants and a rib removed, she struck back. But she openly admits to having had breast implants to plump back her breasts after child birth and rhinoplasty (a nose job) to perfect her ethnic nose. She also admits to using laser surgery to erase unwanted tattoos. While Cher may have grown tired of all the speculation about her plastic surgery, the fans don’t stop. Her wrinkle free skin and suasage plumped lips will likely keep her atop the plastic surgery gossip talk for a long time to come. Facelift plastic surgery is the likely reason for her total lack of wrinkles. There comes an age where you simply can’t deny it anymore. She has a tough skin and seems to tolerate the gossip rather well. 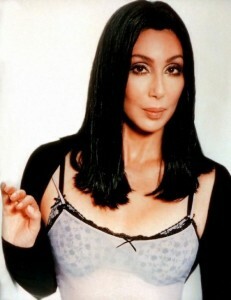 Cher has beautiful hair and an incredible figure for a woman her age. Fans love her.